Most folks living in the indian subcontinent need no introduction to the Peepal or the Bo Tree -- at some point in primary school we are made to go through this exercise - take a leaf of the peepal tree, soak it in water overnight, gape in wide eyed wonder the next morning to see all the green stuff wash away and the bare trellis of the leaf remain, dry the leaf in sunlight and then paint on it! It was one of my favorite activities and many a colored leaf adorned the walls of my room. It is of the Ficus family - same as the banyan. All trees have some religious significance in India, but this one beat the others by getting the 'religiosa' into its name! 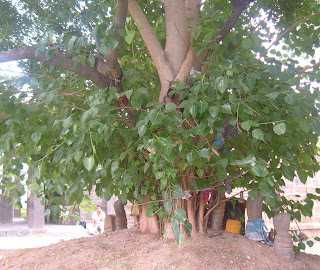 The peepal tree is the one under which Buddha is supposed to have attained enlightenment which probably explains the importance of this tree in the Buddhist and Hindu religions. For some reason this tree has seldom been allowed to grow alone. 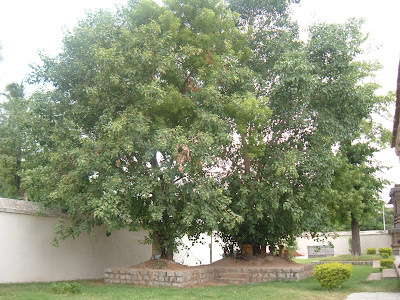 A neem sapling is always planted right next to it and the trees grow together - trunks and branches inextricably interwined by the time they reach maturity. 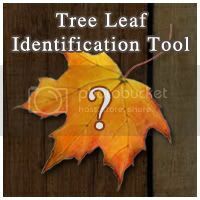 Look at the picture above - the lighter colored leaves are that of the neem and the darker ones, of the peepal. 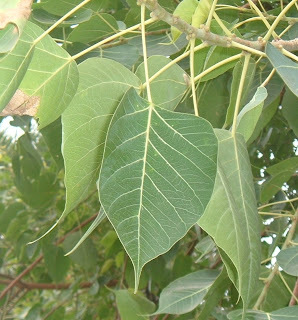 The leaf of the peepal always makes me wonder if it was a regular at the manicurist in an earlier avtar! Seriously, look at it - the pointy showy leaf is so typical of the peepal. The bark is smooth and lighter colored than the neem.